This cousin of S. gesneraeflora is a spreader from the mountains of southern Mexico that can form a small thicket under ideal conditions. It is a late bloomer, and is best grown as a hanging basket plant in colder areas for a sunny greenhouse. It handles humidity well, and should be tried in the warmer parts of the southeastern United States. There are several accessions available, one from Strybing, and an old-fashioned one from Logee’s. The latter is more compact and makes a better hanging basket subject. 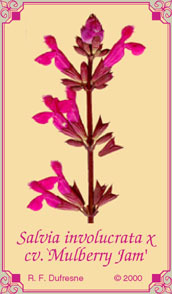 The form of this sage in the illustration is a newer variety than the S. cardinalis form. It looks a lot like S. gesneraeflora. Most of the herbarium specimens of these two species also look a lot alike, and more work needs to be done, or at least an easy way to tell them apart needs to be provided. I was able to cross my S. fulgens with S. gesneraeflora cv. `Tequila’ and will be interested in seeing its blooms. Section Fulgentes is one of the groups of Salvias that badly needs revision. In habit and bloom period, it is very similar to S. gesneraeflora. This would make it a large greenhouse plant for the northern states and a large background plant for warmer areas. A sport from the garden of Betsy Clebsch, my feeling is that the other mystery parent may well be S. chiapensis. It is quite different in some ways from both species, forming tall floral stems like S. uliginosa or Verbena bonairiensis. The flowers definitely are more like S. chiapensis than S. involucrata, and the involucre is still present but reduced in size. It is gaining in popularity on the east coast, especially in the Mid-Atlantic states. It should do well as a tall bedding plant in the warmer parts of the Southeastern states. There will probably be some controversy over the identity of this plant for some time. It was originally distributed as S. oresbia, but is now generally called S. darcyi, based on a publication by Dr. James Compton. I take a different view, based on conversations with T. P. Ramamoorthy (retired) and followed up by an inspection of the type herbarium sheets at the Gray Herbarium. Although I am not a trained taxonomist, the resemblance of the specimen of S. schaffneri to the plant I am familiar with is too striking to dismiss. I believe that Dr. Compton did not have access to this specimen, and that the text description would not have led him to it. I invite someone with taxonomic credentials to check out my assertion that S. darcyi should properly be called S. schaffneri. This is one of my favorite sages for growing in the Southeastern states. It forms colonies from its underground stems. In Mexico, some of these can get quite large. For me it is pleasantly persistent and not invasive. It is a reliable summer bloomer, and forms spikes bearing some of the largest red flowers in the genus. It would be good in the back of the border. The foliage is hairy and pleasantly aromatic, indicating that it tolerates xeric conditions. This sage came into my possession from Longwood Gardens. They got it on a trip to South Africa, and I began distributing it around the United States. 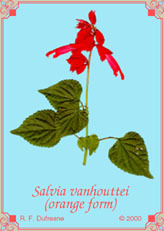 The identity of this plant is now considered to be an early form of S. splendens or a hybrid developed by vanHoutte, a Belgian nurseryman and collector. Its burgundy calyxes are persistent and the flowers quite large. This is consistent with modern forms of S. splendens that have been bred for compactness and increased size and persistence of the calyx. In the garden, it gets quite tall in one season and can be treated as an annual. However, this plant is root-hardy and goes into dormancy over the winter. Unless overwatered, it can spring back to life suddenly in the spring. It should be hardy in all of the warmer parts of the United States, and withstands Florida conditions well. This is the most common sport from the burgundy form. It is less wiry in stem and more like S. splendens in form, suggesting that there is some regression going on during self-pollination. It is not as root-hardy as its burgundy parent. A friend from South Carolina has discovered six new colored forms and is registering them for release. The orange sport is a bit more compact and floriferous than its parent. It also tolerates heat and humidity well.